【Fitness Tracker with Heart Rate】Newest HR sensor adopted for accurate and effective heart rate monitoring. 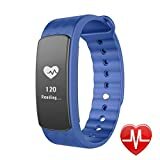 24-hour real time heart rate monitor with HR chart make your fitness conditions visual on “Zeroner Health” APP. 【Wider Compatibility】Bluetooth 4.0, IP67 water resistant. Supports iOS 8.0 or above (iPhone 4S, iPhone 5/5S/5C, iPhone 6/6S plus, iPhone 7/7S plus,etc. ); Android 4.4 or above (Download APP “Zeroner Health” from Apple Store or Google Play. Smart phone only, not for iPad, PC or Tablet). 24-hour real time heart rate monitor with HR chart make your fitness conditions visual on “Zeroner Health” APP. Turn on “Sedentary Alert” function in the app, it will vibrate to remind you to move if you stay at your seat for a long time.